Teenager Moise Kean came off the bench to score the winner as Juventus edged past Empoli, now needing just 13 points for an eighth straight Serie A title. Kean, 19, latched on to Mario Mandzukic's knock down to fire in a cool finish just three minutes after appearing as a second-half substitute. It had been a poor contest up until then, with Juve's Federico Bernardeschi clipping the crossbar with a volley. Empoli failed to work Wojciech Szczesny into making a save in the entire game. With nine games remaining, Massimiliano Allegri's side have already clinched a place in next season's Champions League group stage. They were without injured Portugal skipper Cristiano Ronaldo, who picked up a thigh problem on international duty. Second-placed Napoli - who travel to Roma on Sunday (kick-off 14:00 BST) - are now 18 points adrift of Juve. Match ends, Juventus 1, Empoli 0. Second Half ends, Juventus 1, Empoli 0. Hand ball by Manuel Pasqual (Empoli). Attempt blocked. Ismael Bennacer (Empoli) left footed shot from outside the box is blocked. Assisted by Manuel Pasqual. Corner, Empoli. Conceded by Daniele Rugani. Attempt blocked. Francesco Caputo (Empoli) right footed shot from the right side of the six yard box is blocked. Assisted by Giovanni Di Lorenzo with a cross. Substitution, Juventus. Martín Cáceres replaces Federico Bernardeschi. Attempt missed. Miralem Pjanic (Juventus) right footed shot from a difficult angle and long range on the left is high and wide to the left from a direct free kick. Corner, Juventus. Conceded by Salih Ucan. Substitution, Empoli. Manuel Pasqual replaces Domenico Maietta. Substitution, Empoli. Afriyie Acquah replaces Rade Krunic. Substitution, Empoli. Salih Ucan replaces Marko Pajac. Corner, Juventus. Conceded by Domenico Maietta. Attempt saved. 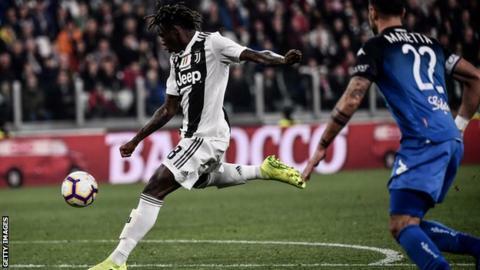 Moise Kean (Juventus) left footed shot from the centre of the box is saved in the centre of the goal. Assisted by Miralem Pjanic with a through ball. Cristian Dell'Orco (Empoli) wins a free kick in the attacking half. Goal! Juventus 1, Empoli 0. Moise Kean (Juventus) right footed shot from the centre of the box to the bottom left corner. Assisted by Mario Mandzukic with a headed pass. Attempt missed. João Cancelo (Juventus) left footed shot from outside the box is close, but misses to the right. Assisted by Emre Can with a headed pass. Substitution, Juventus. Moise Kean replaces Blaise Matuidi. Attempt missed. Giorgio Chiellini (Juventus) header from the centre of the box misses to the left. Assisted by Miralem Pjanic with a cross following a set piece situation. Attempt missed. João Cancelo (Juventus) right footed shot from the right side of the box misses to the left. Assisted by Leonardo Spinazzola with a headed pass. Attempt blocked. Leonardo Spinazzola (Juventus) right footed shot from outside the box is blocked. Assisted by Blaise Matuidi. Attempt missed. Mario Mandzukic (Juventus) right footed shot from the centre of the box is high and wide to the right. Assisted by Miralem Pjanic with a cross following a corner. Corner, Juventus. Conceded by Frederic Veseli.